Target Shuns NFC and Apple Pay as Expected with New Wallet; Service Features Private-Label Card | NFC Times – Near Field Communication and all contactless technology. Target is the latest merchant to introduce payments using 2-D bar codes, as it seeks to avoid merchant fees and keep out competing wallets, such as Apple Pay. Exclusive: Why are Some of the Largest U.S. Merchants Balking at Supporting NFC? Carrefour Pay Launches in China with UnionPay, but Can the Network Beat Back Rivals Alipay and Tencent? 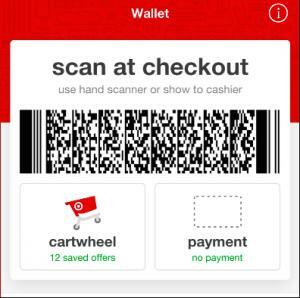 NFC TIMES Exclusive Insight – Target has added its long-anticipated 2-D bar code-based wallet to its mobile app, following rival Wal-Mart Stores in launching its own payments service and shunning NFC and contactless, as expected. Target, like Wal-Mart, still refuses to accept Apple Pay or other NFC-enabled wallets. Also like Wal-Mart, Target sees its new wallet as a way to combine offers and payments into one transaction at checkout and–perhaps more importantly–to save money on merchant transaction fees. Target announced its “Wallet” Monday. It had earlier disclosed plans for the mobile payments service featuring its private-label REDcard. Target made Wallet part of its Target app for Android and iOS, rather than introducing it as a separate payments app. That is unlike Walmart Pay, which Wal-Mart launched in 2015 as a separate app. Article has about 820 words.